Fourth Row Center: Film Writings by Jason Bailey: On DVD: "Grey Gardens (2009)"
When Albert and David Maysles decided to make a documentary film in the early 1970s about Edith and “Little Edie” Bouvier Beale, the eccentric relatives of Jacqueline Kennedy Onassis who had been reduced to living in squalor at their East Hampton summer home, they couldn’t have possibly imagined the cottage industry they were creating. That 1975 film, Grey Gardens, became both a critical smash and a cult sensation; it earned the Maysles kudos from critics and academics for furthering their distinctive “direct cinema” aesthetic, while fans of offbeat cinema made the Beales into icons, memorizing dialogue and watching the picture repeatedly. It became such a part of American pop culture that it spawned a 2006 follow-up doc, The Beales of Grey Gardens, and a Tony-nominated Broadway musical adaptation that ran for over 300 performances. When news broke that HBO was making a new film of Grey Gardens, this reviewer presumed it would be a film version of that Broadway show. But director Michael Sucsy (who wrote the teleplay with Patricia Rozema) is up to something more interesting here; his new Grey Gardens is instead a dramatic companion piece to the documentary (and the story it told), hop-scotching through the Beales’ remarkable story and providing background, sidebars, and footnotes to compliment what we already know from the previous picture. The film begins with the Maysles brothers (Arye Gross as Al, Justin Louis as David) screening their finished film for “Big Edie” (Jessica Lange) and “Little Edie” (Drew Barrymore). We then jump back to the 1930s, when the Beales were hobnobbing with New York’s high society, and from there the film operates on those two parallel timelines: the production of the film and their lives before it, how far they fell and how it happened. Perhaps because I had just watched the documentary in preparation for this film and this review, I was stunned by the uncanny accuracy of the scenes related to that original film; the set and prop reproductions, the re-enactment of scenes from the documentary, and the make-up and costuming of Barrymore and Lange is simply stunning (only one complaint: the single replication of one of their arguments from the doc is too clean—there’s not enough overlapping in their dialogue). But this is not just a curiosity piece for fans of the Maysles films—indeed, the replications are a nice plus for those in the know, but Sucsy’s film stands on its own feet (and plays just fine for audiences unfamiliar with the material). It’s not a flawless picture—some of the cross-cutting (both within timelines and within related sequences) is a little erratic, and Sucsy occasionally takes too-full advantage of opportunities for obvious melodrama (as in Little Edie’s midnight hair-cutting scene, in which the otherwise-strong script and score are too overcooked). However, the tremendous performances at the film’s center more than compensate. 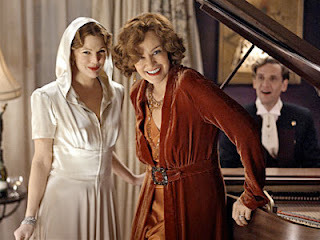 Lange is so consistently good in everything that she does that there is a tendency to take her skill for granted, but this is a tough, emotional (yet emotionally stunted) role, and she nails every note of it. Her cold acceptance of her husband’s wish for a divorce and her breakdown during her first scene alone in the big home are among the best work she’s done in a film. And Barrymore is magnificent. I might have questioned her odd accent had I not just seen the real McCoy; she is spot-on, but there’s more to the performance than replicating Little Edie’s peculiar vocal stylings. Both actors are doing that thing that Jamie Foxx did in Ray or Denzel Washington did in Malcolm X—a flawless impression first, and then a skillful performance that transcends mere impersonation. Barrymore ages from a luminous twentysomething to a balding fiftysomething and never strikes a false chord; she’s always been a wonderfully reactive actor, and this is a performance of tremendous pain and unhappiness, most of it conveyed between the lines and within the subtext. It’s a truly marvelous piece of work, and an excellent reminder that there’s a fine actress within the star of He’s Just Not That Into You. Jeanne Tripplehorn is wonderfully understated in a brief role as Jackie O, whose appearance (during the vivid and fascinating sequence concerning their near-eviction by health and sanitation officials) gives the film a healthy third-act bounce. Some wonder if the original documentary exploited the Beales, holding them up for smug ridicule (and if its cult following is a testament to that). There are compelling arguments to be made in either case, but that’s certainly not a charge that can be leveled at this Grey Gardens; in fact, that question is indirectly asked during its melancholy closing sequences, which are surprisingly moving and bittersweet. The Maysles pictures pointed their cameras at the Beales and showed us the who and the what, but not the why. The Sucsy film asks why, and with the help of two tremendous actors, it may just answer that hefty question. The new HBO version of Grey Gardens sounds like a novelty or a fluke, but it’s the real deal—an intelligent, emotional, impeccably made biographical portrait of two women who remained, if nothing else, true to themselves and true to each other. With excellent period details and near-flawless performances, Grey Gardens is well worth a look. "Grey Gardens" is currently available on DVD. Thanks for reading, Christine-- and for the kind words!